Accommodations: Four lodges with varying styles, layouts, and room types. Price Includes: Includes 7 nights accommodations at the Red Mangrove Galapagos Lodges, roundtrip transfers from/between Baltra Airport and all islands, welcome drink, Jacuzzi at Aventura Lodge, private terrace and social areas, all meals on fixed menu basis, 5 days of diving with all equipment (except dive computers), wireless internet access in rooms (weather permitting and not in Floreana), Eco Excursions with English speaking naturalist guides, use of available bikes and all taxes. Choose from four Lodges – Aventura, Floreana, Isabela, and San Cristobal. Each is unique but all are intimate, comfortable, and elegantly appointed retreats from which to base your Galapagos dive adventure. The Aventura was built in 1995. The unique design blends with the local mangrove forest and seafront. The location allows you to observe the mangrove ecosystem in action as well as the best view of Puerto Ayora’s bay. With 14 guest rooms divided in 2 areas, seaside, or inside the mangrove, The Aventura Lodge is quaint and equipped with with a/c, cable TV, private bathroom and hot water. 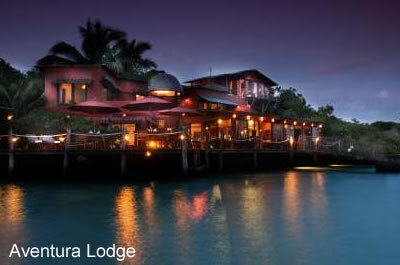 Try the sea side restaurant with choice of Japanese or Galapagos fusion cuisine. Being located 5 minutes away from the main part of town and 3 minutes walking to the “Loberia” where you can observe the sea lions in their natural environment. Your 10 independent cabins each equipped with 1 full size bed and a double-bunk bed can host up to 4 people each. Enjoy your own bathroom, front porch to enjoy the outdoors as you observe the sea. The Floreana Lodge’s common area houses the dining room and a grill kitchen, where you can relax and enjoy the company of other guests. The oceanfront Floreana Lodge is separated from the ocean by a broad, white sand, palm-lined beach and has a beautiful wooden deck by the sea for all to enjoy, as well as a roof top terrace with sea vistas for miles. All guest rooms have 2 queen beds and a private bath and 3 guest rooms have amazing sea views. “Casa Iguana Mar y Sol” aka The Lodge on San Cristobal, is a large,private house which was built with 4 separate entry suites. The three-story property has spacious living units and unbelievable views of the Pacific Ocean and marina. Situated just 100 yards from the shoreline, it is the finest, most carefully finished property on the island of San Cristobal. Book the Presidential Suite on the third-floor or the second-floor suites are air conditioned and has a private entrance, private bathroom (with warm-water shower) and spacious sitting area. Your suite open onto a large, covered walkway with balcony seating. You can enjoy 6 days of diving on 4 of the finest islands the Galapagos has to offer: Isabela, San Cristobal, Santa Cruz and Floreana. Start your trip in Santa Cruz with dives on the north coast. Then head to Floreana for diving at Enderby and Champions. After Floreana you will head to Isabela to dive Tortuga, 4 Hermanos and/or snorkel at Los Tunnels with Galapagos Penguins. Finally, after Isabela you will head back to Santa Cruz and then to San Cristobal for one of the only Wreck dives available in the Galapagos and Kicker Rock. There are many equally beautiful dive sites at each island and the captain will pick what is suitable for all on board. The number of dives can vary due to change of weather and/or conditions. Dive sites change, so please keep in mind that your sites may change due to changes in rules and regulations that are our of our control. The Galapagos Islands are a treasure not only for Ecuador but for mankind. Please tread lightly on the environment.